Help! The Countess Maritza shot my worth ethic. Just now I wrote a little thing for my, ahem, Music Critic blog. I was running my mouth about musicians named Kunz, not that there are that many of us, and I ran a link to this courtly Viennese baritone Erich Kunz singing a song from the operetta "Countess Maritza." Here is the link. But I warn you. Do not listen to it! It will totally shoot your work day! You do not even have to understand what Herr Kunz is singing! Music can do that to you. When I worked at the Niagara Gazette I had been working there for exactly one week when, and this really happened, the Grateful Dead shot my work ethic. I went to California with my brother George to go to the Grateful Dead's New Year's Eve show and I never, ever recovered. I just had so much fun! Here I had been all enthusiastic about my new job and I got back home and I am sitting there thinking: What am I doing here? After a year and a half or something I walked. Watch out what you listen to! So this morning, here I am, listening to these dreamy Viennese songs. By the second time I listened to that song from "Countess Maritza" I had my chin in my hand and I was staring into space. I began thinking of this trip my mother and I took to Vienna where we went to the opera every night and after that went to this cafe for a glass of white wine. We heard a Brahms concert at the Musikverein. That is one of the most beautiful concert halls in the world. It is all gold. Leonard Pennario played recitals there. 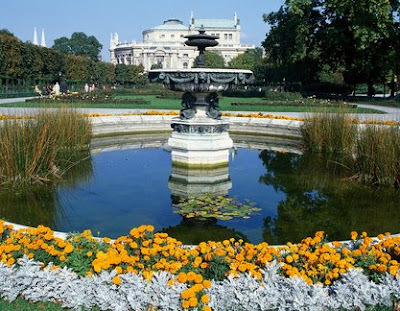 My mom and I decided on that trip to Vienna on the spur of the moment. I mean, we decided on Wednesday to go on Friday. I don't know how I was able to pull that off. Probably I was unemployed, who knows. That is a picture of Vienna up above. I don't remember where that fountain is exactly but we were there. What about Old Vienna? It is second from the left. Then there was my brother Tony's birthday last summer. We all went to see my sister in East Aurora. I went swimming in a pond with my nieces Rosie and Millie and my nephew George Henry. And after that Tony's friend Peter showed up in his little convertible and he asked me if I wanted to go for a ride and I said yes. With which, we put the two little girls in the back seat and Peter put on a straw hat and we drove the byways of East Aurora on that beautiful summer day, laughing and listening to Fritz Wunderlich singing songs from "Countess Maritza." Including the one Erich Kunz just sang. And this one. What a wonderful day that was. I want to live it over. Zut alors, or ach du lieber I should say. I was going to continue yesterday's pattern and piously write about miracles and now look, suddenly I am sitting here all dissatisfied with my lot. I do not want to work. I want coffee. I want pastries! Then I want operetta. And white wine. Well, at least I have the coffee. That is a start anyway. I would LOVE to have one of those days like you had in Easy Aurora. But like the bumper sticker said, "I can't afford to step on the gas". This was reinforced when I passed The Crook gas station at the corner that just went up to 2.15 for gas. Starting to gouge us for the summer driving way before summer even gets here!! !